Net Entertainment’s (NetEnt) South Park slot comes packed with bonus features that can help players win many more coins than the top fixed prize of 750 credits. South Park has 25 fixed paylines, eliminating the need for players to manually select the lines they would like to play. Players can bet up to 10 coins per activated payline, choosing from a coin value range of $0.01 to $1.00. The max bet for South Park slot is $250.00, which makes it the high-rollers favorite slot. The reels of South Park feature icons of high-value cards along with Cartman, Kyle, Kenny, and Stan. Players who have previously enjoyed watching South Park will be familiar with these lively characters. The slot features animations, audio effects, and graphics lifted directly from the sitcom, giving players the feeling that they are watching it all over again. 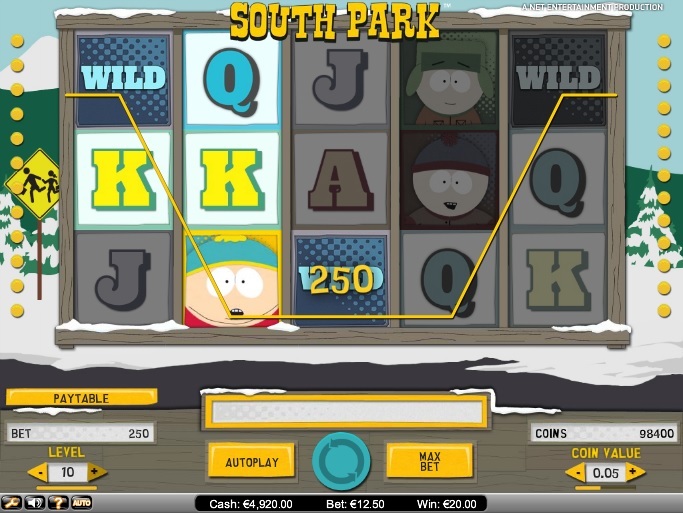 An icon marked WILD serves as the wild substitute in case of South Park slot. But players should note that it does not substitute for the bonus symbols to help players unlock the bonus features. South Park is very popular for its three randomly activated mini bonus features, each developed in honor of its main characters. In the Terence and Philips feature, three wild symbols appear anywhere on the second, third, and fourth reels, substituting for all other icons except the bonus icons and helping players complete winning combinations. In the Mr. Hankey feature, three wild symbols will appear anywhere on the first, third, and fifth reels, substituting for all other symbols and helping players complete winning combinations. When the Cartman feature gets activated, the highly innovative Beefcake Wild, which is an entire block of wild symbols appears at random on the second, third, and fourth reels. The slot also has four bonus games, each developed in honor of Kyle, Cartman, Stan, and Kenny. During the Kyle Bonus Game, Kyle will kick Baby Ike to make him land on multiplier values of x10 or x2 or a bonus prize of 2 coins. The Kenny Bonus Game comprises three zones—the Win Zone where players can win coins, the Danger Zone with one trap and plenty of coin wins, and the Multiplier Zone where players can win multipliers. Players can win up to 139,000 coins here. In the Cartman Bonus Game, Cartman has to search through the bushes for coin wins or multipliers. The game ends if a police officer appears on the scene and nabs Cartman. The Stan Bonus Game features a sticky wild symbol, which appears at random all over the reels and remain frozen in position while the reels are re-spun twice. The slot is available for fun or real money play at any NetEnt-powered online casino.